The Kickstarter has already been funded (and I have backed it!) which is excellent news but that doesn’t mean extra support isn’t extremely helpful to Lois and Joohn and if you do back the project it is cheaper that retail! The Pebble Stationery Pocket Notebook comes in a two pack of 80 pages (compared to 48 pages which is common in other comparable notebooks) of 52gsm Ivory (white) Tomoe River paper. The notebook 3.5” by 5.5” (8.9cm by 14cm) which is field notes sized (rather than traveler’s notebook sized). The notebook is machine made in China - which is not a negative - and comes with a 2-pack of 2B pencils that come with an eraser on the end. I am not much of a pencil person but I will do my best reviewing this! This is definitely a worthy cause and it’s great to see. The packing that the notepad came in for me isn’t final and was described to me as makeshift. So I’m not going to cover it much. Mine came in a simple plastic wrap. Under the wrap the there is a slim paper sleeve with appropriate descriptions of the notepad on it. It’s unflashy, has appropriate information which suits the rest of the minimalistic design. The cover is a grey subtle canvas-like texture. It feels mostly smooth with a slight unevenness to the touch. Debossed on the bottom right of the front cover is, in capitals, “Pebble Stationery Co.”; this is the only thing adorning the cover. Again, nice and subtle. The paper glued to the inside of the cover is a pale blue and the front cover of the Pebble Stationery Notebook has a useful form printed on it that you can fill out. Firstly is name and contact (in case the notebook gets lost). After that is a content section and then a location. Depending on how you use notebooks this might be very practical to you. Especially if you use different notebooks for different topics or different physical locations. It’s a nice touch. The back cover addresses the charitable aspect of the notebook. Below that is details of the paper. My version describes it as 5m dot grid but this isn’t correct (and will be correct on the final release); the paper is 4mm not 5mm. It’s great to have this information present but I can’t help but feel like this back cover could have a more practical use to it especially if you are onto your third refill (you should know about the charitable side by then). This is an extremely minor ‘issue’. The binding of the notebook is a sewn spine, and does not use staples. I’ve had staples rust in the past and Pebble Stationery also state that they’ve avoided stables because they can snag on things. The stitching is also very tight and secure and uses a thin thread. The stitching is also not on the outside of the notebook with the cover being glued over the stitching and to the end paper. Many other notebooks do not have an end paper and have the binding visible on the outside. The above photos compare the stitching of the Pebble Stationery Pocket Notebook with an alternative field notes sized pocket notebook that I have. The stitching on the alternative uses a much thicker thread and also only less tight stitching with it only stitched through in three places (compared to 27 on the Pebble Stationery notebook) it is also very visible on the outside of the cover. 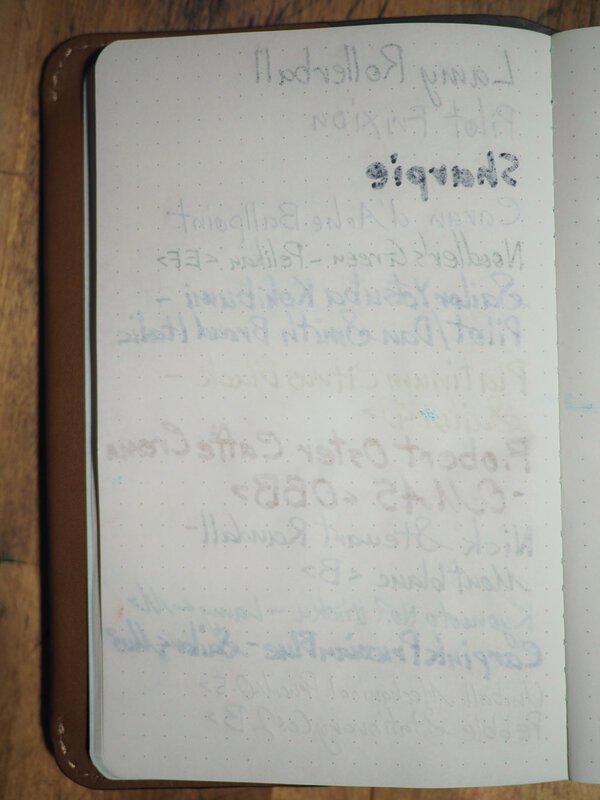 I am not saying that this is indicative of all alternatives nor that it is a major issue but this is the one I had on hand and does show the higher quality of the binding in the Pebble Stationery notebook. The paper is 52gsm Tomoe River with the Ivory colour. Ivory with Tomoe River is the whitest colour Tomoe River but is still an off white. It isn’t nearly as yellow as the Ivory of Rhodia or G. Lalo. If you have used 52gsm Tomoe River you should be familiar with this paper. The paper uses 4mm dot grid spacing which is the same as what Hobonich compared to the 5mm of Rhodia’s dot grid. I don’t have a strong opinion of this either way; I use Hobonichi’s 4mm dot grid and Rhodia’s 5mm dot grid daily and I don’t really have a preference. The benefit of Tomoe River is that the paper is super smooth to write on but not so smooth that it exacerbates baby’s bottoms or other problems with pens that might cause skipping. Indeed the softness of the paper seems to help prevent skipping even with pens that have a baby’s bottom. My theory is that because the paper is so soft and thin it moulds to the contours of the nib tip more precisely than a firmer paper like 68gsm Tomoe River or Rhodia’s 80 or 90gsm. Tomoe River also has a slower dry times as the paper isn’t very absorbent which means that sheeny inks have more time to form their sheen and often produces very sheeny written lines. I love sheen so I love this feature. I find that Tomoe River can flatten inks a little bit so they aren’t necessarily as shady as on other paper. As is usual with 52gsm Tomoe River paper there is see-through where you can see what is written on the successive leaf and also ghosting where you can see what was written on the inverse of the leaf you are currently on. This is simply part of the paper. This doesn’t bother me much and never has but I understand why some people don’t like it. The fountain pen ink, ballpoint ink and (obviously) pencil do not bleed through but the Sharpie does bleed through (which it does on most paper). The Lamy rollerball also bleeds through ever so slightly. Another common issue with Tomoe River, especially with sheeny inks, is smudging and wetter inks taking longer to dry. This is something I’ve chosen to live with as 52gsm is always by go-to paper. The final issue, and this is one that does bother me a little, is how it is quite susceptible to hand oil. Other papers are as well but it is more prominently displayed with Tomoe River in my experience. 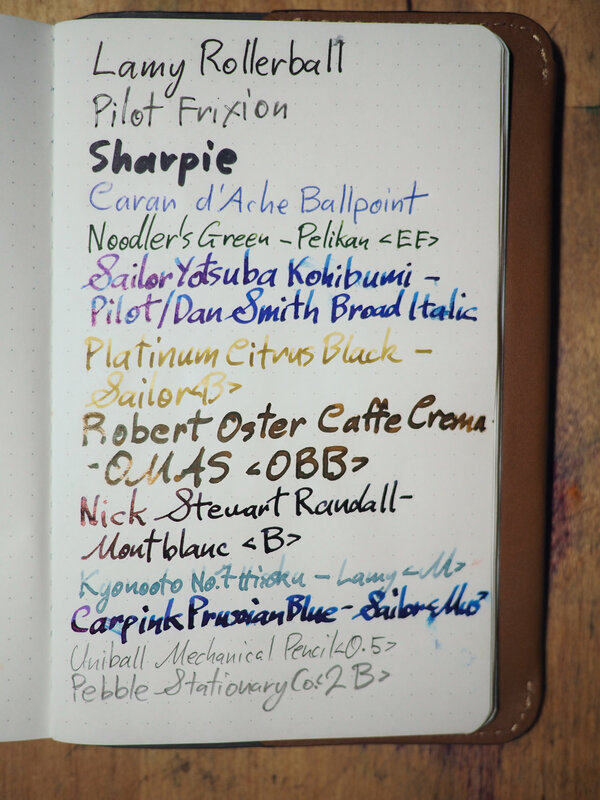 The problem with hand oils is it creates a slick on the paper where the ink doesn’t apply properly to the paper which can be seen with the “R” and “OM” on the Robert Oster and OMAS line above. Some inks, Montblanc in particular in my experience, lose a bit of saturation on Tomoe River paper and can look a little sad, by contrast some Noodler’s inks often look sad and unsaturated on Rhodia but really come to life on Tomoe River. It’s a case by case matter. Overall Tomoe River 52gsm has it’s benefits and it’s negatives and it’s a balance issue for what you consider important. For me the benefits outweighs the negatives and as I said 52gsm Tomoe River is my preferred and go-to paper. To review this properly I wanted to get to know this notebook in a real situation. I wanted this to be my primary notebook and I always have a cover on my primary notebook so I did the only sane thing to do with a freely provided review unit and purchased a AU$90 leather cover for it! Before this notebook I had a Traveler’s Company Notebook (though technically mine is Midori before the separation of the company) with a 010 Refill Kraft File insert to hold files and a 003 Refill Blank refill which I believe is Tomoe River. This is an old Traveler’s Notebook so it’s somewhat beaten up. I had other refills in it in the past but I always had issues with the paper staying within the confines of the leather so I reverted to a single refill. I find it easier to write in the Pebble Stationery Pocket Notebook in the Belroy case due to it opening flatter and also due to the fact that the notebook is a larger size. The Belroy case also has a handy magnetic feature which holds the cover closed as opposed to an elastic band which disfigures the leather a little over time (which I don’t personally have an issue with). There are plenty of alternative cases available for the 3.5” by 5.5” standard. I chose the Belroy case because it’s also Australian, it was available locally and immediately to me and it had some nice features. Moving forward I’m confident I will keep using this notebook and this case as my EDC notebook. The notebook pack and also comes with a two pack of pencils. These hexagonal pencils are 2B and come eraser. 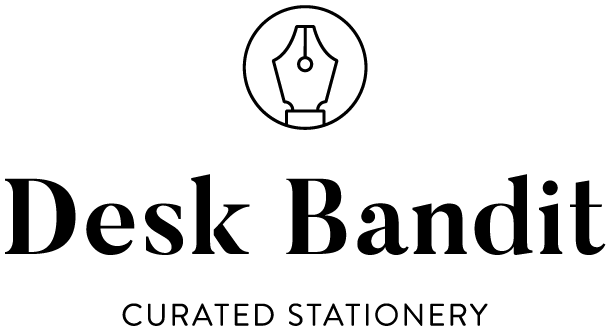 They are grey like the notepad (though the grey seems cooler) and have a debossed light grey “Pebble Stationery Co.” on one of the faces. I don’t particular like writing with pencil on Tomoe River (or Rhodia) as I it feels too smooth for me. The 2B does make a dark enough line on Tomoe River though so I don’t think there is an objective issue with this pencil on this paper. The eraser rubs off the pencil quite well on Rhodia and the Tomoe River. As I said above I am not much of a pencil person. This pencil write well, erases easily and I haven’t found an issue with it. This is a notebook a received for free but I have subsequently backed the Kickstarter project and I have invested in a pricy cover for it and intend on it being my EDC notebook moving forward. I think it is well designed and well constructed. The notebook 2-pack with a pencil 2-pack is AU$13 before shipping on the Kickstarter right now and will retail for US$9.99 (around AU$14.5-AU$15) after the Kickstarter ends. I think this is quite reasonable for such a well made notebook. I admit that I’m really pleased to see local projects (to me) like this so I’m glad to see this project being backed and being successful but I have put my money where my mouth is and I do genuinely think this is a well made notebook and I do like the minimalistic design and the charitable nature of it. I think this is well worth backing. The kickstarter is currently live and eventually there will be more information on the Pebble Stationery Co. website. Pebble Stationery Co. also have an Instagram. I received this pack free of charge for the purpose of giving an honest review. I was not otherwise compensated and everything here is my own honest opinion. There are no affiliate links.